. :: Team Gold for the Netherlands ::. 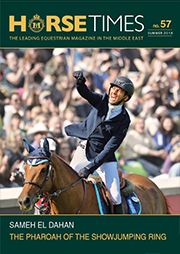 The first medals have been awarded at the FEI European Championships Aachen 2015: Team gold in the Dressage in the Lambertz-Prize, the team Grand Prix, went to the quartet from the Netherlands, Britain claimed silver and the bronze medal went to the German team. It was a close result: 235.629 points was the final score of the new team European Champions, the silver-winning team notched up a total of 234.229 points. The bronze team finished on an overall score of 230.914 points. "We are very happy," said the overjoyed Dutch team rider, who achieved the best result, Edward Gal, and added with a grin looking round at the other medal winners: "In fact, we are the happiest team here today!" It was the first time that the Netherlands won team gold at the European Championships since 2009. Back then, Gal formed part of the gold medallist team with Totilas. 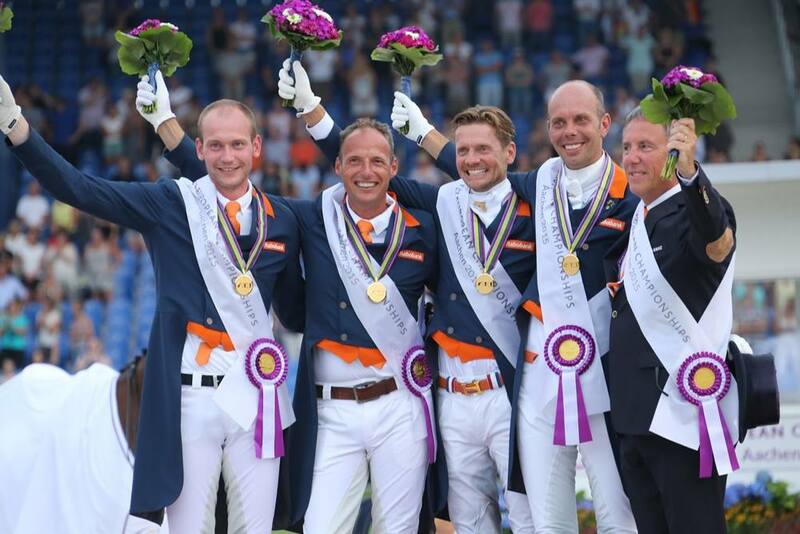 The team European Championships in dressage have been staged since 1965, for the Oranje team the victory in Aachen was their third European Championships title. The winning team comprised of Edward Gal with Glock’s Undercover, Hans Peter Minderhoud with Glock’s Johnson, Diederik van Silfhout with Arlando and Patrick van der Meer with Uzzo. "We had four top horses here with four top riders," stressed the Chef d'Equipe of the Netherlands, Wim Ernes. "Winning a gold medal in Germany is especially exciting!" Gal delivered the best result for the gold-winning team after achieving a score of 82.229 percent, which was the second best result in the Lambertz-Prize overall. "We are also very happy at winning the silver medal. We had a very strong team with a new rider," beamed Carl Hester, team member of the Brits and winking at the new European Champions: "And we just get stronger and stronger – Holland! It is going to get exciting in the future!" The British team was made up of Hester with Nip Tuck, the new team member Fiona Bigwood with Atterupgaards Orthilia, who achieved the second highest result in the team. Hester is also the trainer of the British Olympic gold medallist and World Champion, Charlotte Dujardin. Indeed, Dujardin actually topped the ranking in the Lambertz-Prize with Valegro as expected, but she didn't quite achieve the score everyone was expecting. "The fault in the zig-zag half-pass was totally my mistake," admitted Dujardin after her ride. "and I was thinking about that when I started the flying changes." Which resulted in a further error. 83.029 percent was the best result in the Grand Prix, but it was nevertheless far off what the world record-holding pair have scored before in the Grand Prix, namely 87.460 percent. Germany's most experienced and most successful dressage rider, Isabell Werth, took the bronze medal with humour: "We have achieved our goal. We wanted to claim the bronze medal, because it is too boring winning gold all the time and since we are good hosts and horsey people, we wanted to make the two other teams really happy." Werth laughed loudly, then the 14-time European Champion added seriously: "We simply weren't as good as we can be, so it was a fair result that the others won. But watch out, we will try to come back again next year." The strongest pair of the bronze-winning team was Kristina Bröring-Sprehe and Desperados, who finished on a total score of 79.743 percent, they didn't achieve the expected result either. "I thought Desperados would pull forward more. I had to push him on more than expected, but apart from that he was super to ride. On Saturday, we will be ready and raring to go again." The best three pairs from the team classification qualify for the MEGGLE-Prize, the Grand Prix Special, on Saturday in the battle for the individual medals. In addition to the three medal-winners, three further teams had reason to celebrate today: Spain, Sweden and France. The three teams who finished fourth, fifth and sixth respectively, secured themselves as such a ticket for the Olympic Games in Rio de Janeiro next year. "I am overjoyed that we have succeeded in qualifying," rejoiced the trainer of the French team, Jean Bemelmans, and added with a laugh. "We were far off the mark in past years, but we really have succeeded in getting there now. Now, I am sure I won't be sacked, before I retire."